Burlington Progressives endorsed Steve Goodkind for mayor Sunday evening, lauding him as a "man of the people" who's accustomed to getting his hands dirty. The former public works director is seeking to unseat Miro Weinberger, a first-term Democratic incumbent. He received 40 of 43 votes cast. 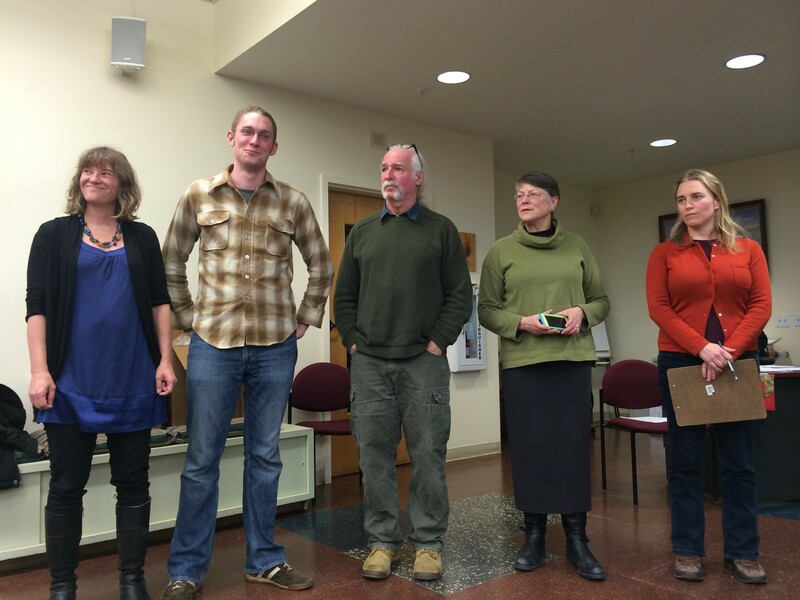 Progressives also selected city council candidates at their caucus. They're fielding four candidates for the 12-member council. In a rapidly delivered 20-minute speech that would have gone longer if Progressive city chair Kyle Silliman-Smith hadn't cut him short, Goodkind said he's encountered widespread dissatisfaction with Weinberger. He told the roomful of Progs that he'd scrutinize large development projects more thoroughly and would promote "small organic development" rather than large-scale projects. Goodkind also pledged to throw his weight behind efforts to preserve local ownership of Burlington Telecom and said he'd be more aggressive about pursuing repayment of the millions of taxpayer dollars that were diverted to keep BT afloat under the administration of former mayor Bob Kiss. Councilor Jane Knodell and state Rep. Chris Pearson (P-Burlington), who both nominated Goodkind for the endorsement, praised his record as DPW director and his understanding of "the nuts and bolts" of how the city operates. Greg Guma, who received one vote on Sunday, had expressed interest in running as a Prog; he attended the caucus but did not seek the endorsement. Weinberger provided Seven Days with an emailed statement that congratulated Goodkind on the endorsement and defended his own record. "I welcome a careful review of the city's accomplishments of the last three years: fixing the city's badly damaged finances, cleaning up the Burlington Telecom mess, vastly improving municipal transparency, and beginning the restoration of our waterfront, bike path, parks, garages, and other municipal infrastructure following years of neglect. The voters on March 3 will have a clear choice between continuing the last three years of steady community progress or stepping backward." Due to redistricting, instead of electing two councilors in each of seven wards, Burlington voters will choose one councilor for each of eight wards and one councilor for four districts, which each consist of two wards. Currently, Progs occupy five of the 14 seats; Democrats hold seven. Selene Colburn, a Ward 1 councilor, is running for the east district, which consists of Wards 1 and 8. Knodell, a Ward 2 councilor, will run for the central district, comprised of Wards 2 and 3. Max Tracy is seeking to hold onto his Ward 2 seat. The Progs' two Ward 3 councilors — Rachel Siegel and Vince Brennan — opted not to run again, citing health and family reasons, respectively. Progs endorsed Sara Giannoni, who works at COTS and is on the neighborhood planning assembly's steering committee, to fill the one slot they leave. Two independents — Ward 1 Councilor Sharon Bushor and Ben Vidal, a University of Vermont student who's running for the newly formed Ward 8 — attended the caucus and received supportive votes. Vidal said Knodell, an economics professor at UVM, encouraged him to run.